You know what? Even this isn’t entirely bad. This is a flip that’s happened in recognition of a parallel inversion: renewable energy is increasingly profitable without subsidies, and coal has become uninvestable without government intervention – this used to be the opposite. The table below is from the Australian Energy Market Operator’s (AEMO) South Australian Fuel and Technology Report (SAFTR 2017), and it summarises a whole bunch of different grid stabilising options in South Australia. “High RoCoF” is the rate of change of frequency – essentially, how fast changes happen on the grid, and what can be used to the stabilise the system when these changes happen. “UFLS” is cutting off demand when demand is too high (“load shedding”), and “OFGS” is cutting off generation when generation is too high. The way we consume electricity is changing from a passive, infrequent experience to a regular and active one. We’ll be making consequential decisions about our consumption, and some of us will be making consequential decisions about our electricity generation (those of us that have solar installed on our rooftops). Instead of thinking about money every three months, we’ll think about it every week, or every day, or even every time we flick on a power switch. The benefits of mass adoption of this are huge. People will get money and they might not even notice temperature changes from switching their AC from 18°C to 21°C for an hour. The grid managers might eventually not have to keep as many expensive generators on reserve. 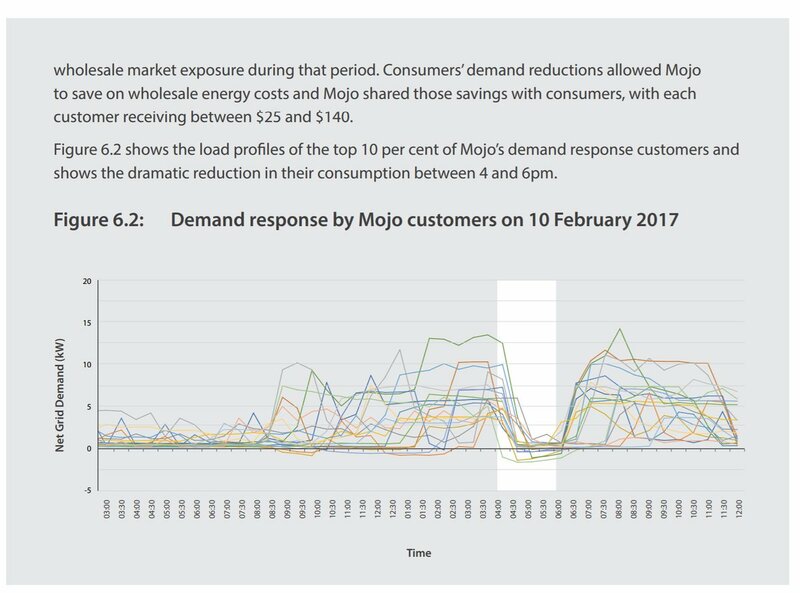 The wholesale price will be significantly lower, particularly during periods of high demand (everyone who pays for electricity will see the results of those savings). The probability of blackouts or forced load-shedding massively decreases. Emissions intensive diesel generators, that ramp during extremely high-demand, high-price events, can stay off and avoid emitting greenhouse gases. This is an incredible innovation, and at the heart of it is a simple philosophy of granting control and influence to the people who pay for power. There’s other stuff, too. Decentralised electricity trading and renewable energy for people who live in apartments, people who rent (my entire generation) and people who own homes but can’t afford to install solar are all important and there are a huge number of clever companies starting up that address these issues. It sounds melodramatic, but it’s a thing that’s played a big part in aversion to the emergence of new energy technologies that generate electricity whilst avoiding the harmful impacts of greenhouse gas emissions. Specifically, wind and solar (mostly wind) drew ferocious and strongly-expressed ire from people who see the construction of these machines as a worldview-crushing threat rather than a way of making electricity happen. A few months ago, former Prime Minister Tony Abbott called for the act of converting atmospheric kinetic energy to electricity to be made illegal. This article expresses enthusiasm for demand response but the forms of demand response that involve paying people not to consume electricity suffer the flaw that it is impossible to know how much electricity would have been consumed if people hadn’t been paid not to consume it. Selling electricity below cost then paying people not to buy it creates perverse incentives which the alternative of selling electricity at wholesale plus a retail margin doesn’t. The suggestion in this article that the “wholesale price will be significantly lower, particularly during periods of high demand” is the opposite of what is being pushed by advocates. Their idea is to maintain wholesale prices at a level they would have been if the non consumption had actually been consumption so that the full benefit of non consumption can be captured by payments to the non consumers. As non consumption can’t be measured, this is crazy stuff. In the current ACCC Retail Electricity Pricing Inquiry the “ACCC will be mindful of the history of interventions in this market which have too often had unintended consequences to the detriment of electricity users.” As this will likely be another of those I’ve made a submission on the problems with paying people not to consume electricity which can be seen at http://blog.urremote.com/2017/11/paying-people-not-to-use-electricity_10.html . Reducing demand during peaks is good but paying people not to consume electricity is likely to have unintended consequences and should be avoided.